I’m excited to announce the launch of my first eBook! After weeks of writing, editing, and formatting, I’m pleased to now share with you: The Writer’s Manifesto. Pow! This is a good one, a wake up call and just what you need to read. Thanks Jeff, for sharing your art. The Writer’s Manifesto is a small eBook about getting back to the heart of writing. Based on a blog post I wrote called “Writers Don’t Write to Get Published,” this short manifesto is a call for writers to fall back in love with writing for the love of it. If you are a writer, this might be just what you need to reclaim your freedom and rediscover the joy of writing. I heartily recommend it. You can get a free copy of The Writer’s Manifesto by joining my newsletter list. This will automatically subscribe you to free updates and other occasional goodies (e.g. other books and offers and such). I will always respect your privacy, and you can opt out at any time. Once you confirm your email address, you’ll receive a private link to the PDF that you can download. Jeff has declared in this brilliant eBook the silent intentions of so many of us to write once again for the pure joy of writing. He’s called out the things which can creep in a spoil our first love and says our love of writing is worth fighting for. 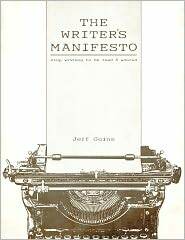 If you’ve already read The Writer’s Manifesto, let me say thank you. This little book was a labor of love, and I’m honored that you took the time to read it. So… what did you think? Print it and give a copy to a coworker or other writer (just don’t charge for it or change it). Share your thoughts and takeaways on Twitter, using the hashtag #writersmanifesto. I loved it! Succinct-true-and applicable. Doesn’t get better than that. To read other reactions and reviews, check out the endorsements page. One outcome that I’m hoping for is that this manifesto inspires you to write something. If you publish something as a result of reading The Writer’s Manifesto, please share it. If it’s online, feel free to include the link in the comments below, as well as on Facebook and Twitter (be sure to use the hashtag #writersmanifesto). I can’t wait to read your work. Ready to fall back in love writing? Enter your email in the box below to get a FREE copy of my eBook The Writer’s Manifesto. Once you confirm, I’ll send a PDF straight to your inbox — no charge. Click here to get started. This manifesto was pure poetry. I felt the inspiration, and for the first time like someone else was able to put in words what I felt and simultaneously needed to hear. It inspired me to write a booklet for my readers- my manifesto, my promise to them. Have a read (it’s a little long, but ay, it’s full o’ heart: https://cl.ly/000r3u2b0R36/download/Everyone%20can%20write%20a%20fandomworthy%20novel%20FREE.pdf ) Anyhow I’m hooked on everything you have to offer writers and am so glad I found your work. I finally feel like I’m on the road to success I’ve hunted for for so long. I’m saving up now to try to afford the Tribe Writers course too. Thank you Jeff for your generosity and your brilliant ideas. I loved this Jeff. Beautiful. I copied it to re-inspire myself. Now, I can’t wait to write my own. I loved your manifesto. Thank you! Create your way beyond your ego. Create for the sake of creating. Hi Jeff, first thank you for the book. Second, I am so glad that you remind us of returning first to love of Writing because we are writers.I am admit some preconceived ideas from over the years of well meaning people giving advice and sharing the rules of writing. Third thing is I have followed every step I can so far of the free stuff you have to offer to this point, and everything I followed, has brought me a result. As soon as I can I will try one of your classes. Youre the honest guy and thank you for that, integrity means everything!